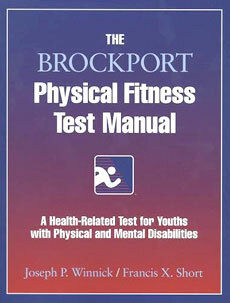 The Brockport Physical Fitness Test (BPFT) is a criterion-referenced health-related test of physical fitness, appropriate for use with young people with disabilities. In 1993 the U.S. Department of Education funded some research which was named Project Target, a study designed primarily to develop a health-related and criterion-referenced physical fitness test protocol for youngsters with disabilities. The age group the study was based around was between 10 and 17 years of age. In total 1,542 youngsters with and without disabilities were tested, and the analysis of these results lead to the creation of the Brockport Physical Fitness Test. The name is derived from the project being centered at the State University of New York, College at Brockport. The physical fitness test battery is able to be customized for nearly any student. The total number of test items available is 27, with a mix of traditional fitness tests and tests specifically modified for youngsters with disabilities (see list below). Although there are many tests to choose from, the manual guides the assessor using a five-step process to which tests are suitable, and most test batteries for individuals will involve only four to six items. Only a few relatively inexpensive materials are required to administer the BPFT, such as a stopwatch, ruler, grip dynamometer, 35-lb. barbell, seated push-up blocks, 1-lb. weight, ramp, curl-up strip, pull-up bars, skinfold caliper, height-weight scale, sit and reach apparatus, heart-rate monitor, 15-lb. dumbbell, and calibrated tapes (provided with the test kit). If these are not available, test item substitutions are often permitted. See more about the Brockport products available from Human Kinetics. The following test resources are available, which provides therapists and educators with the information required to administer and interpret the tests. Winnick, J.P. & Short, F.X. (1999). The Brockport Physical Fitness Training Guide. Champaign, IL: Human Kinetics. Winnick, J. P. & Short, F.X. (1999). The Brockport Physical Fitness Test Manual. Champaign, IL: Human Kinetics. There is also a videotape available that provides a background on health-related information and has a demonstration of the test items, and also a computer software program to select test items, and print out results, goals, and fitness needs for individuals and groups of students. See more products. 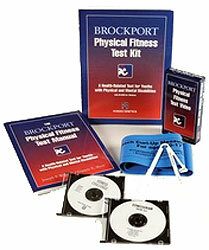 buy The Brockport Physical Fitness Training Guide and Testing Manual, plus other items associated with the Brockport Test. buy the PACER test cd from Human Kinetics - this recording provides pacing for the shuttle run portion of the test as well as cadences for the curl-up and push-up tests. buy the Curl-up Measuring Strip for use with the Brockport Test (or make your own).